Devotion to the Immaculate Heart of Mary is primarily based upon the Sacred Scriptures. In the New Testament, there are two references to the Heart of Mary in the Gospel according to St. Luke: .."Mary treasured all these things and reflected on them in her heart. " (Lk 2: 19) and " His mother meanwhile kept all these things in her heart. " (Lk 2:51) In the Old Testament, the heart is seen as the symbol of the depths of the human soul, the center of its choices and commitments. For all mankind, it is a symbol of love. In the Book of Deuteronomy we are told, "You shall love the Lord, your God, with all your heart, and with all your soul and with all your strength." (Dt. 6:5) When Our Lord Jesus Christ was asked by the scribes which was the first commandment, he answered them by quoting this verse to them. It was the Heart of Mary which expressed her "yes" to God. This was her response to the message sent through the angel at the Annunciation. By her loving consent, Mary first conceived Christ in her heart and then in her womb. Our Lord Jesus, Himself: when reminded by a woman in the crowd how blessed was the womb which gave birth to Him, responds, "Blessed rather are those who hear the word of God and keep it." (Lk. 11:28) Pope John Paul II , in his first encyclical, Redemptor Hominis, wrote "the mystery of Redemption was formed under the heart of the Virgin of Nazareth when she pronounced her 'fiat.'" Historically, devotion to the Heart of Mary can be traced to the twelfth century with such writers as St. Anselm (d. 1109) and St. Bernard of Clairvaux (d. 1153) who is considered as one of the most influential writers in Marian devotion. St. Bernardine of Siena ( 1380- 1444) has been called the Doctor of the Heart of Mary due to his writings on Mary's heart. He wrote, "from her heart, as from a furnace of Divine Love, the Blessed Virgin spoke the words of the most ardent love." St. John Eudes (1601 -1680) helped by his writings to begin a renewal in this devotion. Both Pope Leo XIII and Pope St. Pius X called him, "the father, Doctor, and Apostle of the liturgical cult of the Sacred Hearts of Jesus and Mary." Even two decades before the first liturgical celebrations in honor of the Heart of Jesus, St. John Eudes and his followers observed February 8th as the feast of the Heart of Mary as early as 1643. Pope Pius VII (d. 1823) extended its celebration to any diocese or congregation requesting it. 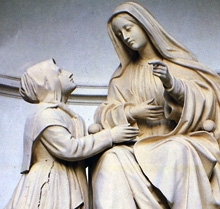 Devotion to Mary's Heart has a greater flowering following the manifestation of the Miraculous Medal to St. Catherine Laboure in 1830 and the Appearances of' Our Lady in Fatima. From May 13 to October 13, 1917, our Blessed Mother Mary appeared to three children, Jacinta and Francisco Marto and their cousin Lucia DosSantos in Fatima, Portugal. On July 13 she told them: "to save poor sinners, God wishes to establish in the world devotion to my Immaculate Heart." The entire Fatima message is one of prayer, penance and making sacrifices and reparation to God for the many offenses against Him. In 1942, the twenty-fifth anniversary of Fatima, Pope Pius XII consecrated the world to the Immaculate Heart of Mary. That same year, he assigned the feast day to August 22, the octave of the Assumption. On May 4, 1944, he extended the Feast of the Immaculate Heart of Mary to the Universal Church. With the liturgical reforms of the Second Vatican Council in 1969, the feast was given a more suitable place on the day following the Feast of the Sacred Heart of Jesus. That is the Saturday after the second Sunday after Pentecost. The opening prayer for the liturgical celebration helps us focus on the important message of this feast day. "God prepared the heart of Mary as a fitting home to the Holy Spirit. May we, His chosen people, become temples of His glory. We ask Mary to help us- her spiritual children, so dear to her heart, to stay ever united in friendship with her Son and never separate ourselves by sin."